Ever since the days of the Duchess of Bedford in the 1840’s, the ceremony of afternoon tea has been seen as the epitome of English style. The fine china, dainty sandwiches and delicious scones, with all the trimmings, have long been the ingredients for a perfect dining experience. In the past, the event may have been considered the sole domain of the upper classes, of Lords & Ladies and Ladies that Lunch. Thankfully that moniker no longer applies and afternoon tea is open to all, for any occasion and indeed for any time of the day. There is no better place to take your tea than the Moat Tea Rooms, where all of the food is freshly made and you make your selection of tea from any of our range of 47 loose leaf teas. We can adapt the tea to your own special occasion and you can even add that extra sparkle by adding a glass of champagne. 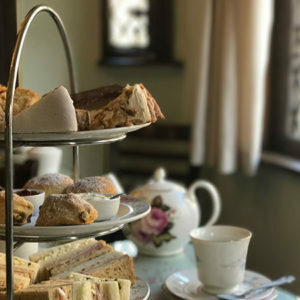 If you want to celebrate a wedding anniversary, a special birthday, a graduation, a reunion or just want to meet up with friends, a delicious cream tea is a perfect event and the Moat Tea Rooms is the perfect location.